I had heard about overnight oats and was always intrigued but had never tried to make them myself. They seemed really easy and the combinations endless – plus they gave you an easy way to grab and go with breakfast in the morning, so what was I waiting for? 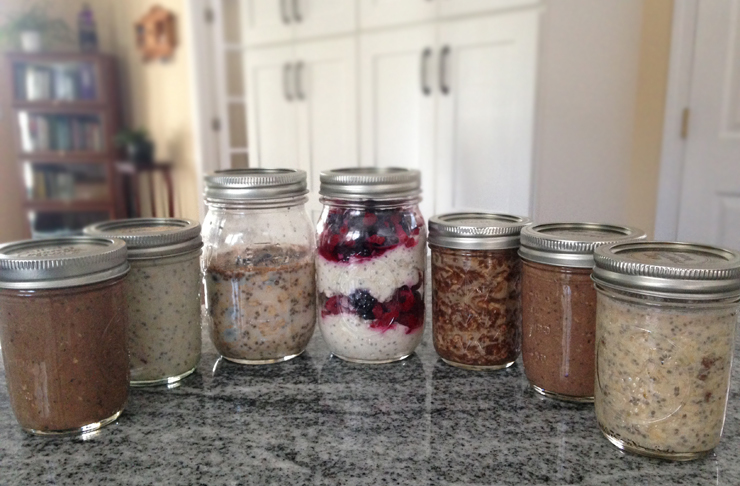 I decided to do a little research and find seven different recipes for overnight oats and give them all a test drive. I would also suggest using a half pint canning jar – some of the recipes said to use a pint jar and that is just WAY too big in my opinion. Overnight oats are really filling. Of course everyone’s appetites are different so maybe start with half pints and then adjust if you need to. Every recipe included chia seeds, an ingredient I hadn’t used before. These little wonders have so many health benefits but they also help to thicken the overnight oats as well. They’re easy to find at the grocery store so I would recommend using them if you can. Each recipe took maybe 5 minutes to put together and then you leave the jars in the fridge overnight. The next morning, they’re all ready to go! They can be ready for you to enjoy in as little as 4 hours if you need a snack quick. I made a few modifications from the original recipe. If you have time and want to make your own date caramel, definitely feel free, but I used a small amount of Stonewall Kitchen’s Sea Salt Caramel Sauce that we carry in our fruit baskets and it was delicious (no surprise there!) I also didn’t make any coffee but instead used espresso powder whisked into water. The final product didn’t have a pronounced coffee flavor, so I’d suggest using actual coffee when you make this. The original recipe suggested putting everything in a bowl and covering with plastic wrap, but I would simply spoon it into half pint jars. The recipe yielded 3 half pint jars worth. I really enjoyed the flavor of this breakfast treat – you almost feel like you get to eat dessert for breakfast! I’m all for cheesecake for breakfast. The only thing I would change moving forward is to use less lemon and a bit more chopped strawberries. The lemon really overpowered the strawberry; of course every lemon is different and I feel like mine was overly large to begin with and very juicy. I’d still suggest decreasing to ¼ of a lemon juiced and zested and ½ cup chopped berries. This one was my favorite – I loved the simplicity of the plain yogurt/oat mix with the frozen fruit. No chopping involved here, just dump it in straight from the freezer! I used a mix of blueberries and raspberries but any combination would be delicious. The original recipe said this made 1, but this was 1 pint jar which I found too much to eat for one breakfast sitting. I’d split it up next time into two half-pint jars. I also tweaked it a little bit and added a tablespoon of maple syrup into the yogurt mix for a little extra sweetness, but this is up to you. I liked that this recipe didn’t require any mixing in a bowl – you just put everything in the jars and shake to combine. What makes these overnight oats skinny? You use skim milk (or soy or almond), there’s no yogurt, lots of fresh fruit and those powerful little chia seeds. The original recipe only called for 4-5 drops of your favorite sweetened so there’s barely any added sweetness – I chose to use maple syrup but you can use stevia, agave syrup or whatever else you prefer. I initially used a pint sized jar but this is really too big for this recipe. A half pint would have been just fine! 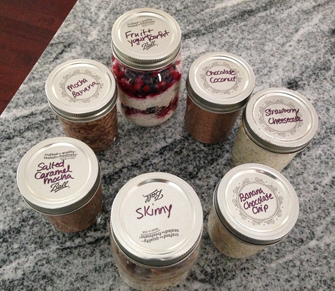 Loved this overnight oats recipe! The combination of banana and chocolate is so good and there’s only 1 tablespoon of chocolate chips per jar so it’s still a healthy breakfast. I opted for mini chocolate chips because I felt like I’d have chocolate in more bites that way but feel free to use normal size ones, too. Next time around, I would probably top this with some sliced bananas to get even more fruit into my breakfast. Mmmm, chocolate and coconut. The chocolatey-ness in this recipe comes from unsweetened cocoa powder so even though it sounds like it shouldn’t be something you eat for breakfast, I promise it is! I enjoyed the coconut flavor from not just the unsweetened flaked coconut but also from the coconut milk. If I could eat nuts, topping this with some slivered almonds would be an excellent choice (along with more flaked coconut, too). I made a few swaps from the original recipe – I am allergic to nuts so I used regular milk instead of almond (and didn’t top with walnuts either). I swapped the warm espresso with espresso powder (but you could also use coffee; if you do this, maybe up it to ¼ cup and use slightly less than a cup of milk). I loved the pronounced cinnamon flavor – I am partial to Saigon cinnamon which packs a huge flavor punch even when you are only getting 1/16 of a teaspoon per serving. Also, definitely make sure you eat this one in just a couple days; overnight oats with sliced bananas don’t last that long. Hope you enjoyed this tour of overnight oats! They are a quick and easy grab-and-go breakfast that only require a small amount of prep time the night before. Customize them to your taste buds and you’ll have a happy belly all week long. Breakfast is the most important meal of the day after all – might as well start out your day on a healthy, delicious note.